Keith McGee scored the first last-place finish of his NASCAR K&N Pro Series West career in Saturday night’s NAPA Auto Parts 175 presented by the West Coast Stock Car Hall of Fame at Kern County Raceway when his #39 Fast5Racing / CCA Motorsports Toyota retired with clutch issues after 16 of 175 laps. The finish came in McGee’s series debut. McGee grew up in the Lake Tahoe area of California dreaming, like many do, of being a NASCAR driver. Like most, life had other plans for him and the dream was left alone. In 2017, the then-35 year old decided to revisit that dream, running a season of Baby Grands at Alaska Raceway Park (ARP). He returned to ARP for another season of Baby Grands this year, winning the final two features of the season. After the season ended the first weekend of September, he raced a Legends car on dirt to try and expand his horizons. He also went down to Talladega with a group of friends for the fall race, where he found his way on-camera, being interviewed by NBC personality Rutledge Wood during the race. As for debuting in the K&N Series? McGee only announced it on his Instagram page on Wednesday before the race, showing a fully prepped car in the Patriot Motorsports Group shop. He joined eighteen other cars on the initial entry list. Taylor Canfield and Travis Milburn rounded out PMG’s slate of drivers. Ron Norman returned in his #40, and David Mayhew came back for his third race this season with Steve McGowan racing and the #17 team. Perhaps the most anticipated story on the entry list was a new father-son combination in NASCAR: veteran racers Billy and Bill Kann were slated to compete in their first K&N West race together. Unfortunately, it was not meant to be, as the elder Billy withdrew the week of the race. Only sixteen cars participated in first practice. Of those, Canfield was the slowest, his lap of 20.415 seconds almost two seconds behind Ryan Partridge’s hot laps. Second practice was nearly identical. This time, all eighteen cars took to the track. Partridge again led with a lap in the 18.5-second range, and the last-place car again ran a lap in the 20.4-second range. Instead of Canfield trailing, McGee was at the rear this time around, running only sixteen laps around the half-mile track. Speeds got more spread out during qualifying, as the top of the field dropped their times, led by Hailie Deegan’s 18.3-second lap. McGee did not put down a great lap in qualifying, his lap of 20.7 a full half-second off of Canfield in 17th. McGee called his K&N debut a “dream come true”. Unfortunately, this time it only lasted about eight minutes, as the #39 exited after sixteen laps with clutch issues. PMG teammate Travis Milburn was next to retire, citing suspension issues after 31 laps. Rich DeLong III was the only other car to retire from the event, an oil leak proving too much to overcome after 137 laps. Ron Norman was the last car running, finishing ten laps down. Canfield rounded out the Bottom Five, finishing eight laps down. As for LASTCAR championships, all had been previously clinched. Chevrolet finished last for the tenth time this season, further extending its lead. 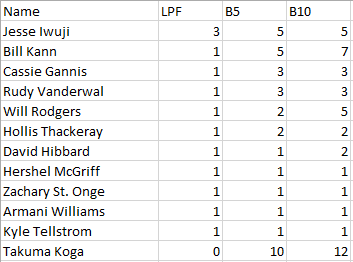 By virtue of a new last-place finisher, Jesse Iwuji becomes the only driver in 2018 to have multiple last-place finishes in the K&N Pro Series West. Patriot Motorsports Group finished last for the eighth time this season, with McGee the sixth different driver to finish last for the organization in 2018. Note: 45 drivers recorded a Bottom Ten finish, and 31 recorded a Bottom Five. The top twenty are shown in this snapshot. Hermie Sadler picked up the 8th last-place finish of his Monster Energy NASCAR Cup Series career in Sunday’s First Data 500 at the Martinsville Speedway when his #7 Virginia Lottery Chevrolet fell out with brake problems after he completed 230 of 500 laps. The finish, which came in Sadler’s 66th series start, was his first since June 4, 2006 at Dover, 451 races ago. In the Cup Series last-place rankings, it was the 40th for car #7, the 78th for brake issues, and the 754th for Chevrolet. Across NASCAR’s top three series, it was the 48th for the #7, the 158th for brake trouble, and the 1,633rd for Chevrolet. The older brother of XFINITY Series regular Elliott Sadler, who closes out his full-time career next month, Hermie has been more well-known for his career in broadcasting, both in the pits for the Camping World Truck Series and on FOX Sports 1’s “NASCAR RaceHub.” It was on “RaceHub” this past Wednesday that Hermie unveiled the paint scheme to his #7, the second car to be fielded by Jay Robinson’s team Premium Motorsports. Sadler would be the driver, continuing a NASCAR career that dates back to 1992 and features back-to-back XFINITY wins at the Orange County Speedway in 1993 and 1994. 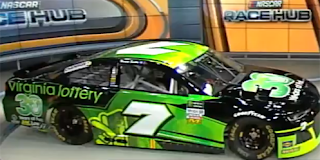 The car would be sponsored by the Virginia Lottery, which has not only sponsored 15 of Sadler’s NASCAR rides since 2001, but has brought on the driver himself as spokesperson for their funding of K-12 education since 1996. This particular incarnation of the Lottery paint scheme celebrated the 30th anniversary of the lottery. It also carried decals for both Breast Cancer and Autism awareness, both causes that have touched Sadler’s family personally. With 40 cars entered for as many spots, Sunday would mark Sadler’s first Cup start of the season and only his ninth since his most recent last-place run in 2006. After running 36th in the opening practice and 37th in Happy Hour, he was slated to start 39th with the slowest completed lap in time trails of 92.497mph (20.472 seconds). Originally, Landon Cassill qualified last for Sunday’s race when his #99 StarCom Fiber Chevrolet was the only car to not turn in a timed lap in Round 1. 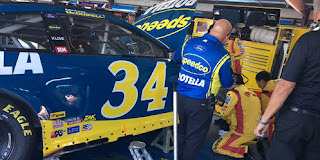 However, by Sunday, Cassill was one of ten drivers sent to the back for various infractions, both he and 8th-place Brad Keselowski in the #2 Thomas Built Buses Ford sent back for unapproved adjustments. Aside from those two and 39th-place Paul Menard, who changed engines on the #21 Motorcraft / Quick Lane Tire & Auto Center Ford, the remaining seven were docked for failing pre-race technical inspection: J.J. Yeley (qualified 34th in the #23 Adirondack Tree Surgeons Toyota), David Ragan (14th in the #38 MDS Transport Ford), Bubba Wallace (32nd in the #43 Pioneer Records Management, a backup car following a crash in Turn 3 during qualifying), Jimmie Johnson (23rd in the #48 Lowe’s For Pros Chevrolet), Jeb Burton (36th in the #51 Jacob Companies Chevrolet), Timmy Hill (37th in the #66 Rewards.com Toyota, a slightly altered version of the Darrell Waltrip 2000 Victory Tour throwback from Darlington), and Martin Truex, Jr. (20th in the #78 5-hour Energy / Bass Pro Shops Toyota). 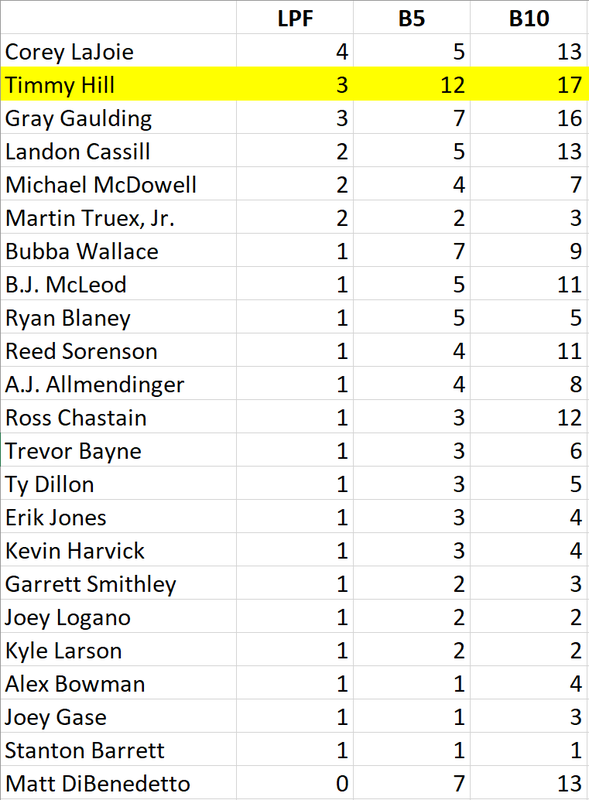 Thus, by race morning, racing-reference.info showed Cassill moved from 40th up to 32nd with Truex, Johnson, Menard, Ragan, Wallace, Yeley, Burton, and Hill – the seven drivers docked for failing inspection, plus Menard’s engine change – slotted into the final eight spots according to their rank in Owner Points. Thus, last place changed hands on the grid with Hill’s #66 sitting 40th in line on pit road, awaiting Cassill and Keselowski to fall to the rear once more for their penalties. During the pace laps, Cassill pulled to Hill’s inside on the backstretch, and Keselowski slotted in front of Cassill on the inside of Row 19. On the break, Cassill slotted into last, but he closed back in on Hill on Lap 4, then cleared him off Turn 4. Hill then caught Sadler on Lap 9, and the tail end of the field went from two-by-two formation to single-file by Lap 13. By that point, Sadler had incurred some cosmetic damage to the left-rear corner of his car when Martin Truex, Jr. nudged him entering Turn 1 on the first lap. Sadler was the first driver to lose a lap by the 22nd circuit, though he worked his way past Hill again by Lap 33. The next last-place challenger arose on Lap 43, when Jeb Burton’s first start of the season took a detour into the Turn 2 wall. Burton’s #51 Jacob Companies Chevrolet pulled to the inside of the backstretch, letting traffic go by under the ensuing caution. Hill just cleared the lapped Burton by the entrance of Turn 3, dropping the #51 to last. While it first appeared that a right-front tire sent Burton into the wall, radio transmissions recorded by RacingUnderdogs indicated it was a melted left-front. Regardless, Burton returned to the track on Lap 46, now four laps back of the leaders. He was six behind at the end of Stage 1 on Lap 132. By Lap 221, Burton was seven laps down when Hill began a series of compounding struggles. After a green-flag stop, the jack got stuck under the driver’s side of his car, forcing a second stop to remove it from the side skirt short of the left-rear wheel. A crewman came over the wall too soon, forcing another stop, ultimately dropping him nine laps back and into 40th place. Following this, both Regan Smith in the #95 WRL General Contractors Chevrolet and Austin Dillon in the #3 Dow Chevrolet fell off the pace and spent several laps on pit road, as did Sadler in his #7. While both Smith and Dillon returned to the track laps down, Sadler pulled behind the wall with brake issues. By Lap 249, Sadler had taken last from Hill, and on Lap 269 the crew radioed “We’re done” and instructed the team to break down their pit equipment. The #7 was pulled off RaceView on Lap 288. Finishing 39th was William Byron, whose #24 Liberty University Chevrolet exploded a brake rotor and backed into the Turn 4 wall on Lap 366. Hill wound up 38th, his rough afternoon ending with a detonating engine that caused flames to shoot from behind both front wheels. Hill steered his Toyota onto pit road, where quickly climbed out and crews put out the flames. With Hill uninjured, the crew tried to laugh off the situation, though the team remarked that the hood was the car’s most expensive part. “I think we have one-upped DW on his flames,” someone said. “Well, we got TV time,” said another. Taking 37th was Kyle Larson, whose #42 First Data / Clover Chevrolet lost an engine exiting Turn 2 and stopped in Turn 3, requiring a lengthy clean-up to get fluid and the car off the track. Rounding out the Bottom Five was Matt DiBenedetto, whose Halloween-themed #32 Keen Parts / CorvetteParts.net Ford had an extended stay behind the wall during Stage 3 and finished 49 laps down, just a few carlengths in front of the last-lap battle between leaders Joey Logano and Martin Truex, Jr.
*This marked the first last-place finish for car #7 in a Cup race at Martinsville since April 2, 2006, when Robby Gordon’s #7 Menards Chevrolet lost an engine after 7 laps of the DirecTV 500. Sadler was entered in that race as well, but failed to qualify after he was the slowest of the 49 entered drivers to attempt the field. It's the first time the number finished last in any Cup race since last fall at Talladega, when Justin Marks fell out after crash damage. *Sadler’s 451-race gap between last-place finishes in Cup stands at 12 years, 4 months, and 22 days, ranked fourth among the longest streaks between finishes behind Joe Ruttman (15 years, 6 months, 22 days, or 494 races from 1988 to 2004), Mark Martin (14 years, 11 months, 5 days, or 440 races from 1982 to 1996), and just last month at the Roval, Stanton Barrett (12 years, 11 months, 7 days and 464 races from 2005 to 2018). 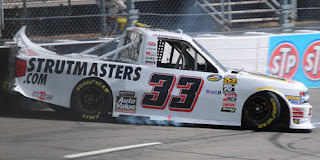 Chad Finley picked up the 1st last-place finish of his NASCAR Camping World Truck Series career in Saturday’s Texas Roadhouse 200 at the Martinsville Speedway when his #33 Auto Value / Strutmasters.com Chevrolet was involved in a crash after 35 of 200 laps. 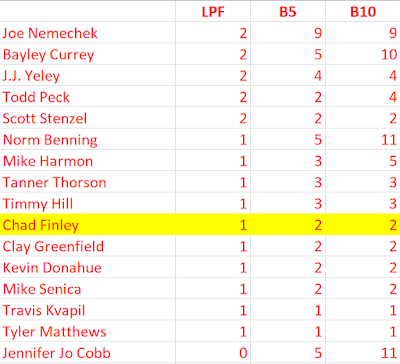 The finish came in Finley’s fifth series start. In the Truck Series last-place rankings, it was the 3rd for truck #33, the 147th from a crash, and the 363rd for Chevrolet. Across NASCAR’s top three series, it was the 46th for the #33, the 1,167th from a crash, and the 1,632nd for Chevrolet. A second-generation racer from Dewitt, Michigan, Finley began racing go-karts when he was ten, earned a championship when he was eleven, and transitioned into the ASA Late Model Series at fifteen. Two years later, Finley followed his father Jeff’s career path into the ARCA Racing Series. 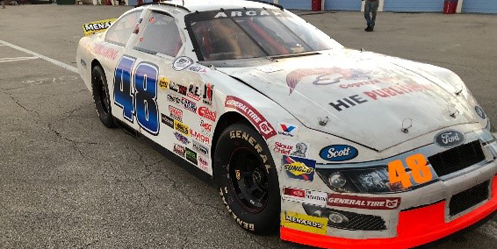 The younger Finley teamed with the Keselowski family to run in the ARCA Racing Series, where he finished 6th in his debut at Toledo and took the pole in the next-to-last series event at Rockingham. 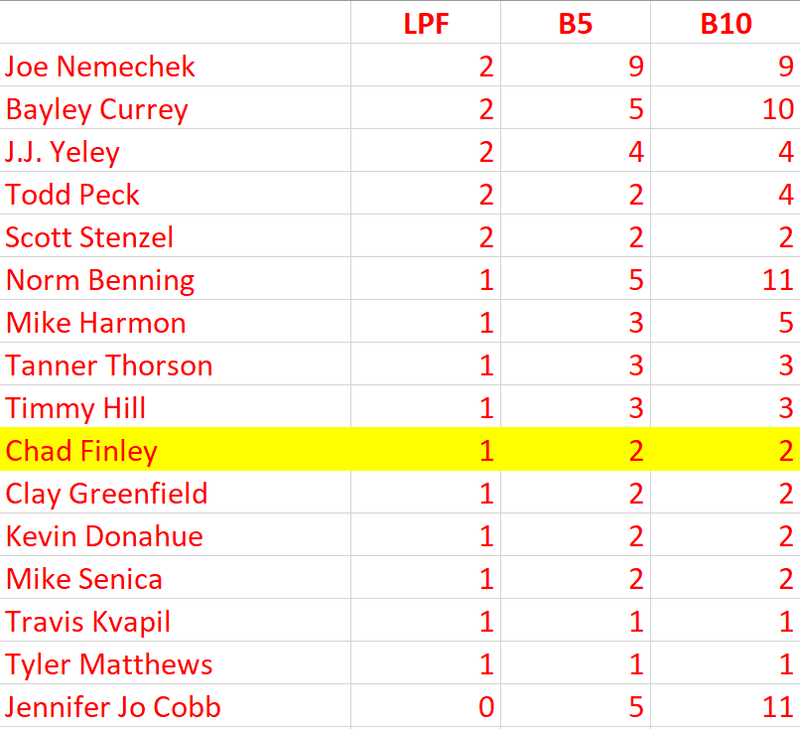 In the years since, Finley has competed part-time in ARCA in between repeated attempts to break into NASCAR competition. The first of these attempts was the June 18, 2011 XFINITY Series event at his home track, the two-mile Michigan International Speedway. Finley picked up a ride with veteran team owner Ed Rensi, who was facing sponsorship issues for his single-car operation. Finley brought with him sponsorship from Auto Value Certified Service Centers, which backed many of the driver’s efforts, but a wreck in practice forced the team to withdraw. This turned out to be the Rensi team’s final entry into a NASCAR race, twelve years after his father Jeff gave the team its first XFINITY start at Daytona in 1999. In 2015, Finley looked to the Truck Series, where his father raced in 2002. This time, the Auto Value sponsorship decorated the #30 Ford of a new start-up team founded by Mark Rette. The pair’s first attempt again came at Michigan, where this time the youngster qualified a solid 15th and finished 21st, four laps down. He qualified again three rounds later at Chicagoland, where he matched his 21st-place finish. But, after Terry Jones drove for Rette twice more, this team also shut down. Undeterred, Finley continued to capitalize on whatever opportunities he could find. 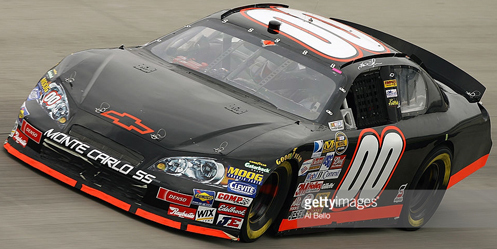 On October 18, 2015, Finley started 6th in the All American 400 exhibition, led 19 laps midway through the event, and finished 4th in a race won by current XFINITY regular Daniel Hemric. On December 6, 2016, he dominated the Snowball Derby at Five Flags, leading 169 of 300 laps before the engine let go. Then on April 8, 2017, again at Nashville, he took his first checkered flag in ARCA competition, leading nine laps and passing current Cup Series part-timer Kyle Weatherman with just two laps to go. The momentum culminated this past June, when both Finley and family returned to Truck Series competition at Gateway, carrying additional sponsorship from Strutmasters.com. In the driver’s first attempt in nearly three years, Finley not only bested the two teams he needed to beat in qualifying, but started 20th and finished 6th, besting all but two of the six Playoff drivers still competing for the title on Saturday. The #42 Ford returned two months ago at Bristol, but after qualifying 12th, the engine let go short of the halfway point, leaving him 30th. Martinsville marked Finley’s first Truck Series start since Bristol. This time around, he would drive for owner-driver Josh Reaume’s team, Reaume Brothers Racing, in the #33 Chevrolet. Finley took the place of Robby Lyons, who remained with the Reaume team at the track, with Auto Value, Strutmasters.com, and Airlift as sponsors. With rain cancelling all track activity on Friday, Finley would once again have to pull off a strong qualifying lap. This he again accomplished, timing in 20th of the 35 entries with a lap of 92.910mph (20.381 seconds). It was the best qualifying run for the Reaume team all season, better than Reaume’s own 22nd-place run at Chicagoland. Three teams failed to qualify on Saturday morning. Just sixteen-hundredths of a second kept Norm Benning from starting in his #6 H&H Transport Chevrolet, followed by Ray Ciccarelli in Jennifer Jo Cobb’s second truck, the #0 CMI Installations Chevrolet. Third to miss was Landon Huffman, who lost control of Al Niece’s #38 Plan B Sales Chevrolet during qualifying and was struck by the #49 SobrietyNation.com Chevrolet of D.J. Kennington. Kennington secured 24th on his Round 1 speed while Huffman, with no timed lap, was sent home. Starting 32nd on Saturday was the #10 Driven2Honor Chevrolet of Jennifer Jo Cobb, who was upset with NASCAR over the lack of pre-qualifying practice. In a Facebook post, Cobb messaged that she would not be able to acquire used practice tires from other teams, nor would she be able to address several minor issues with her truck, including the splitter, brakes, and seat belts. Such adjustments after qualifying incurred Cobb a redundant unapproved adjustment penalty, the same thing that flagged Kennington for repairs from the Huffman incident as well as the #22 AM Technical Solutions / Go Texan Chevrolet of Austin Wayne Self and the #20 Go Share Chevrolet of Tanner Thorson. Thorson, the last-place finisher at Las Vegas, was the first to pull behind the wall on Lap 3 with brake issues of his own. On Lap 36, he returned to action a full 33 laps down to the leaders. But that same lap, Thorson would be denied the 32nd-place finish. Running by himself, Finley (according to Lyons’ tweet) lost his brakes entering the third corner and slid up the track. Video showed the truck complete a 180-degree turn before smashing the wall with the left-rear, then the left-front. Finley climbed out unhurt, and the truck was towed to the garage area, done for the afternoon. Thorson passed Finley for last around Lap 69, but advanced no further than 31st before he retired in the closing stages. Finishing 30th on Saturday was John Hunter Nemechek, who burned the rear gear inside the final 30 laps. These were to be the only three DNFs of the afternoon. In 29th came Cobb, who finished under power, though 11 laps back of race winner Johnny Sauter. Closing out the group was Brad Foy, who like Finley earlier this year had been waiting to make his return to the Truck Series. After two unsuccessful attempts to make a Martinsville race in 2015 and 2016, Foy secured the 31st spot on Owner Points in Premium Motorsports’ #15 Strutmasters.com Chevrolet and finished 28th, six laps down. For more on Chad Finley, check out his website at this link. *This marked the first last-place finish for the #33 in a Truck Series race since November 13, 2015, when Brandon Jones’ Lucas Oil Chevrolet crashed after 7 laps of the Lucas Oil 150 at Phoenix. The number had never before trailed a Truck Series race at Martinsville. 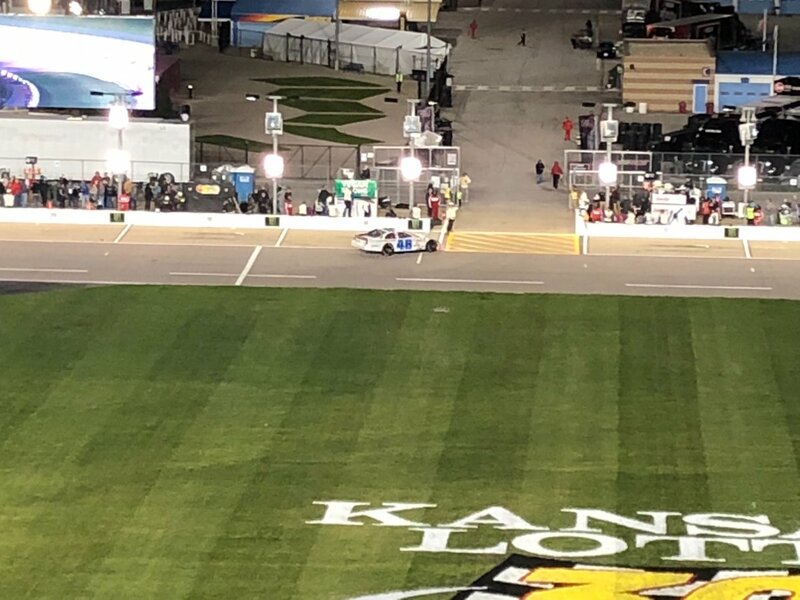 Brad Smith finished last for the 13th time in his ARCA Racing Series career in Saturday night’s Kansas ARCA 150 at Kansas Speedway when his #48 Brad Smith Motorsports Ford retired with a vibration after 1 of 100 laps. The finish came in Smith’s 328th series start, and was his first since Charlotte, 14 races ago. Since the last time Smith has trailed the field, the Brad Smith Motorsports team has gone through ups and downs. The team picked up sponsors Copraya Web Design and HIE Publishing, but on-track results have been rough, with the team failing to finish the previous three races before Kansas. Smith pulls the #48 behind the wall after the opening lap. ARCA’s final race of the year was its first on an intermediate since Chicagoland - and accordingly, attracted many of the drivers known for driving intermediates and superspeedways. Leilani Munter and Michael Self filled out Venturini Motorsports’ three-car stable, Truck drivers Harrison Burton and Todd Gilliland were entered, and some local(ish) drivers were also entered, including Kevin Hinckle and Eric Caudell. It is often a surprise when a lower-funded team enters another car or a different driver at a race, but when one of the top teams in the series does it, it serves notice. That happened twice at Kansas, with Toyota test driver Drew Herring popping up out of nowhere to pilot a second Joe Gibbs Racing car and Anthony Alfredo drove a fifth MDM Motorsports car. Cole Glasson drove a second Win-Tron Racing car, Tyler Hill returned to Fast Track Racing, and L.B. Skaggs made his first Kansas start. Two cars, however, did not make it. J.J. Pack withdrew his family effort, and Jesse Iwuji and his Patriot Motorsports Group team did not enter. Kansas was the seventh race on the team’s original slate, but due to trying circumstances, perhaps their rash of early-season wrecks, the PMG team decided not to enter. 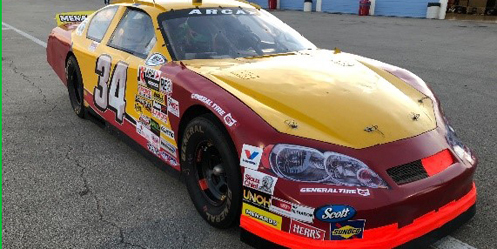 Sheldon Creed clinched the ARCA championship by completing a lap in practice. He also recorded the fastest lap in practice, more than seven seconds ahead of Smith, the slowest car. Cars were all spread out through the order, with only twelve cars running within a second of the leader. Qualifying was much the same way, as Herring put on a clinic to secure the pole. Smith did not take a timed lap (the team had been dealing with overheating issues throughout the day), but the slowest driver who did, Wayne Peterson Racing’s Con Nicolopoulos, was more than six seconds back of Herring. The race for last was over quickly by some standards, but it was about average for ARCA. Smith completed a lap and then pulled into the garage, avoiding the multitude of incidents that would occur during the race. The team found the issue to be something with a vibration and running hot, but did not expand upon that. The team did, however, strike a note of resilience, hinting at another season next year and some hard work in the shop over winter. Mike Basham wheeled his #34 behind the wall after 10 laps, victim of a car that didn’t want to handle. L.B. Skaggs pulled his #71 behind the wall three laps later due to rear end issues. Then, the carnage started. Todd Gilliland finished 22nd after blowing a right front tire near the quarter mark of the race, and Joe Graf Jr. rounded out the Bottom Five after wrecking himself and Travis Braden on Lap 34. Crash victims filled out four more spots, and at the top of the Bottom Ten was Con Nicolopoulos of Wayne Peterson Racing. The WPR team fixed up its old intermediate Dodge for the final race of the season, looking to run about three quarters of the race. They exceeded that goal, running 82 of 100 laps in the final race that the old-style cars were allowed on intermediate tracks. In 2019, ARCA will move to composite cars only on all tracks over three-quarters of a mile in length, a blow to some teams that may have only one or two composite bodies in the shop. It’s been a quarter of the schedule, almost two months, since a LASTCAR article on ARCA has been written. Since then, there have been many changes, but not on top. Wayne Peterson is your 2018 LASTCAR ARCA Drivers Champion. Wayne Peterson Racing is your 2018 LASTCAR ARCA Owners’ Champion. Ford is your 2018 LASTCAR ARCA Manufacturers’ Champion. 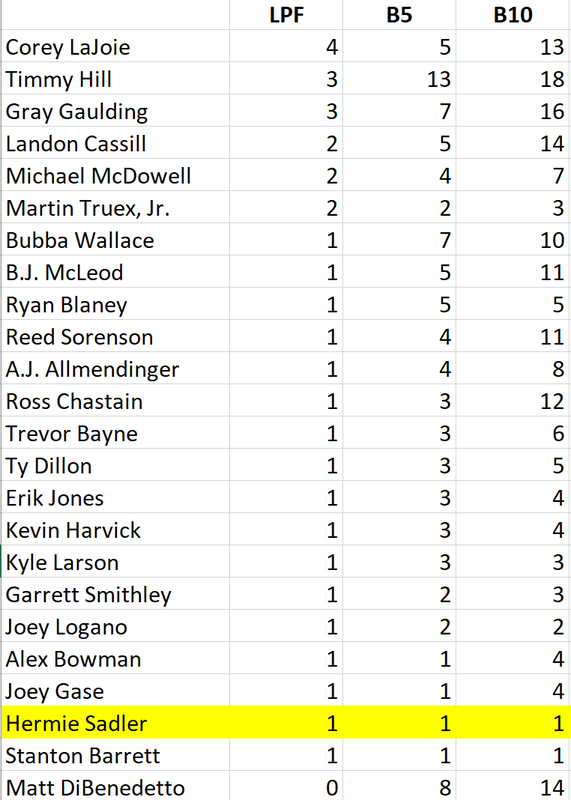 NOTE: 71 drivers recorded a Bottom Ten finish during 2018, and 43 recorded a Bottom Five. The top twenty are shown in this snapshot. There are 35 drivers entered for Saturday’s return of the Truck Series, meaning three teams will miss the show. Sheldon Creed takes the place of Spencer Gallagher with AM Ortega and United Rentals as sponsors. Martinsville will mark Creed’s first Truck Series race on pavement after starting the last three Eldora races with three different teams, finishing 16th for SS-Green Light Racing in 2016, 27th for Bryan Hill in 2017, and 15th for MDM Motorsports this past summer. Korbin Forrister and the All Out team aren’t entered this week following back-to-back top-fifteen finishes of 13th at Las Vegas and a 15th at Talladega. Randy Young’s team scales back to two trucks this week, leaving the #12 Chevrolet at the shop. Tanner Thorson, who had early suspension trouble at Talladega, leaving him 31st, moves from the #12 to the #20, taking the place of Max Tullman, who isn’t entered. Welcome back Brad Foy, who eyes his first Truck Series start after two unsuccessful attempts at Martinsville with Jennifer Jo Cobb’s team in 2015 (when he withdrew due to engine trouble), and narrowly missed the cut in 2016. Foy takes Jamie Mosley’s place in the #15, two weeks after Mosley failed to qualify. D.J. Kennington replaces the now-retired Wendell Chavous, 5th at Talladega, in the #49 SobrietyNation.com Chevrolet. Both Foy and Kennington look to make the most of their starts as Premium Motorsports announced on October 18 that they will be shutting down their Truck Series operation at season’s end. 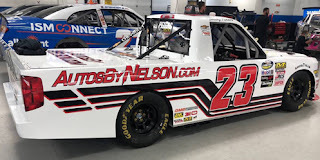 Kyle Benjamin returns to the Truck Series for the first time since the spring race, when he finished a close runner-up to John Hunter Nemechek. This time, he moves from DGR-Crosley’s #54 from the spring to the returning #17, which hasn’t hit the track since Las Vegas. GMS Racing brings the #23 Chevrolet back to the Truck Series for the first time since Chase Elliott took it to victory lane at Martinsville on April 1, 2017, making theirs a four-truck operation for Saturday. Driving the #23 with sponsorship from AutosByNelson.com is Timothy Peters, who took the win two weeks ago at Talladega in GMS’ #25. This week, the #25 goes to dirt tracker Tyler Dippel, back for the first time since he ran 13th in his debut at Eldora, with the America First Super PAC and Turning Point USA as sponsor. Jeb Burton looks to make his first Truck Series start of the season and his first since this race last year, when he ran 26th for Bryan Hill. He takes the place of Scott Lagasse, Jr., 18th at Talladega, and will carry sponsorship from Strutmasters.com and SparrowRanch.org. Recall that Burton’s best series finishes at Martinsville were a pair of 3rd-place runs in both 2013 races, when he drove for the now-shuttered Turner Motorsports. He will also pull double-duty in a return to the Cup Series (see below). Welcome back Chad Finley, who we last saw finish 30th at Bristol in his second start driving his own #42 Auto Value Certified Service Centers Chevrolet. This time around, Finley takes the place of Robby Lyons in Josh Reaume’s primary truck, and will join Jeb Burton in carrying Strutmasters.com sponsorship (along with Airlift). It will be Finley’s first series start at Martinsville. Al Niece’s third truck returns for the first time since Las Vegas, and for the fourth time in as many starts this year will have a new driver behind the wheel. This time, it’s Landon Huffman, who eyes his first series start of the year. Huffman made two starts in 2017, finishing 20th at Bristol for MB Motorsports and 17th for D.J. Copp in this same race last year. PlanBSales.com will sponsor the truck. 17-year-old Christian Eckes returns for his third start of the season, his first since he led 34 laps at Gateway in June only to be eliminated in an accident. Eckes has led laps in both his starts this year, and on Saturday looks to make his Martinsville debut with Craftsman as sponsor. Chris Fontaine looks perhaps to Daytona in 2019 after one of the oldest trucks still operational in the series was destroyed in a hard wreck at Talladega. Harrison Burton takes the wheel in place of David Gilliland and will carry Morton Buildings as sponsor. It will be Burton’s fourth start of the season and first since Mosport, when he ran a season-worst 13th. Burton has completed every lap of his four previous starts, including the spring race at Martinsville, where he ran 8th. In the lead Gilliland truck is Tyler Ankrum, who makes his series debut on Saturday with May’s Hawaii as sponsor of the #54. Ankrum, age 17, is this year’s K&N Pro Series East champion with four wins in DGR-Corsley’s #17 Toyota. He takes the place of Bo LeMastus, who was collected in the Lap 59 pileup that collected Fontaine and finished 29th. Kyle Donahue looks to make his fourth start of 2018, his most Truck Series starts in a single season. As at his most recent start in Texas, Donahue drives the #63 from Mike Mittler’s MB Motorsports, taking the place of Bobby Gerhart, 23rd after electrical issues in Talladega. Clay Greenfield isn’t entered this week after finishing last at Talladega with suspension trouble. Dawson Cram rejoins the Truck Series circuit for the first time since the spring race at Martinsville, when he finished 17th for Beaver Motorsports. 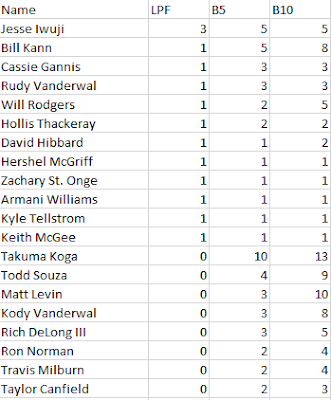 That finish still stands as the season-best for Mark Beaver’s effort, which has been absent from the series since they withdrew last month in Las Vegas. Cram takes the place of Joey Gase, who failed to qualify at Talladega, and carries sponsorship from RGS Products and THP. Joe Nemechek and the second NEMCO entry, #87, are not entered this week, following a 30th-place run at Talladega after qualifying 7th. 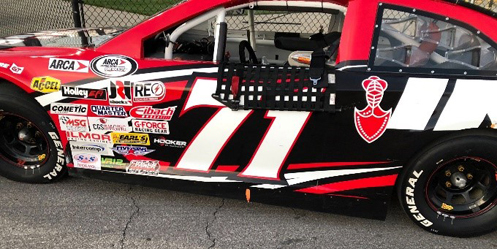 Following Tyler Ankrum from the K&N Pro Series East into the Truck Series is Mississippi’s Chase Purdy, 4th in last year’s standings, and 4th in this year’s ARCA Racing Series Championship. Ankrum, a member of the “NASCAR NEXT” program, carries Bama Buggies as sponsor on Matthew Miller’s #99, a truck we haven’t seen on the track since Sheldon Creed’s 15th-place run in Eldora. Tyler Matthews drove the #99 to a 21st-place finish when the series last ran at Martinsville. There are 40 drivers entered for 40 spots, marking the 15th full field in 33 races this season and ninth in the last ten. Matt Kenseth swaps in for Trevor Bayne once more, carrying Wyndham Rewards as sponsor of the #6 Ford. It will be Kenseth’s 13th start of the season and the 662nd of his career. The veteran was quoted earlier this month that he currently has no plans to drive Cup beyond his final two starts in the #6 next month in Phoenix and Homestead. Hermie Sadler and his sponsorship from the Virginia Lottery have been a frequent visitor to the Martinsville Speedway – fourteen times, in fact, most recently last fall driving to a 34th-place finish for Tommy Baldwin Racing. Then, as now, Sadler drives the #7 car, now under the Premium Motorsports banner, taking the place of Reed Sorenson, who fought handling issues at Kansas. Adirondack Tree Surgeons rejoins J.J. Yeley and Bob Jenkins’ #23 Toyota for the first time since the Roval. The sponsor also backed Yeley’s run in Premium Motorsports’ #55 this past spring at Martinsville, where he ran 31st. Originally, Rick Ware Racing had no driver listed in the #51 Jacob Companies Ford, which was a Chevrolet last week driven by B.J. McLeod, who finished 33rd, 17 laps down. By Wednesday, it was revealed that Jeb Burton would drive the car, making his first Cup start since August 1, 2016 at Pocono, when he ran 36th in the #32 of Go FAS Racing. Sunday will be Burton's first Cup start at Martinsville since this same race in 2015, when he ran 27th during the closing stages of his difficult rookie campaign for BK Racing. Cole Whitt climbs back aboard the #72 for the first time since his 20th-place showing on the Roval, bringing with him sponsorship from Moen. He takes the place of Corey LaJoie, who retains a one-finish lead in the 2018 LASTCAR Cup Series Championship over Timmy Hill, who is again entered Sunday in Carl Long’s #66 Toyota. D.J. Kennington rejoins the #96 team for the first time since Daytona in July, taking the place of Jeffrey Earnhardt. Kennington ran 28th in the spring race at Martinsville. Landon Cassill moves from the #00 to the #99 this week, taking the place of Kyle Weatherman, who isn’t entered following a 35th-place finish due to transmission issues in Kansas. In place of Cassill in the #00 is Joey Gase, who returns with sponsorship from Donate Life and a paint scheme similar to Premium Motorsports’ #55 car earlier this year at Fontana. The XFINITY Series returns next week in Fort Worth for the first of three consecutive triple-header weekends to close out the 2018 campaign. With all the close racing and chaos of a typical race at the Martinsville Speedway, it’s rare that a driver finishes last after leading any laps. It’s happened just four times in track history. The first of these wasn’t until September 22, 1996, when Rusty Wallace started outside-pole and led 35 laps before his #2 Miller / 25 Years of Racing Ford fell out with a busted water pump after 148 laps of the Hanes 500. To this day, it remains the most laps led by a Martinsville last-placer. Timmy Hill picked up the 8th last-place finish of his Monster Energy NASCAR Cup Series career in Sunday’s Hollywood Casino 400 at the Kansas Speedway when his #66 Ternio Toyota fell out with engine problems after he completed 3 of 267 laps. The finish, which came in Hill’s 81st start, was his third of the season and first since Dover, two races ago. In the Cup Series last-place rankings, it was the 54th for car #66, the 153rd for Toyota, and the 684th from an engine failure. Across NASCAR’s top three series, it was the 64th for the #66, the 305th for Toyota, and the 1,063rd from engine trouble. With the finish, Hill leapfrogs into a close second in the 2018 LASTCAR Cup Series Championship, posing the first threat to Corey LaJoie’s lead all season. 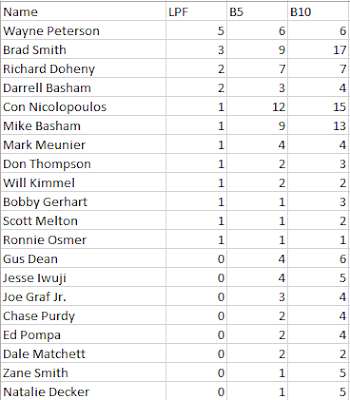 By outmatching LaJoie in both Bottom Fives and Bottom Tens, Hill can take the LASTCAR lead by finishing last in any of the four remaining races. Gray Gaulding, who also has three finishes in 2018, needs two last-place runs to accomplish the same. Following Dover, the Motorsports Business Management (MBM) team skipped the final plate race of the year in Talladega and set their sights on Kansas. Hill would run double-duty at the 1.5-mile oval, starting the weekend in the #13 OCR Gaz Bar Toyota in Saturday’s XFINITY race, then the #66 Ternio Toyota for Sunday. Just over a year after the track saw MBM make their first Cup start in May 2017, Kansas would see the Cup team debut MBM’s own in-house engine program after previously using PME Engines. On the XFINITY side, Hill ran 29th and 26th in practice, then qualified 25th – just seven-hundredths of a second short of making Round 2. It was the seventh time in 28 starts Hill had qualified 25th or better in 2018, though a vibration after 54 laps left him 31st at the finish for his 18th DNF. On the Cup side, speed was a bigger issue. The #66 ran just 39th in the first session, 40th and last in the second, and turned in the slowest lap in qualifying with a speed of 177.708mph (30.387 seconds). Hill was the only driver to not run a lap in Happy Hour, and the team changed engines for Sunday’s race. On Sunday, Hill incurred a redundant tail-end penalty for the engine change. Also sent to the rear were Chip Ganassi Racing teammates Jamie McMurray and Kyle Larson in similar Halloween-themed McDonald’s paint schemes. While McMurray also changed engines, Larson, in a “must win” situation for Sunday’s Playoff cutoff, wrecked his primary car in opening practice. 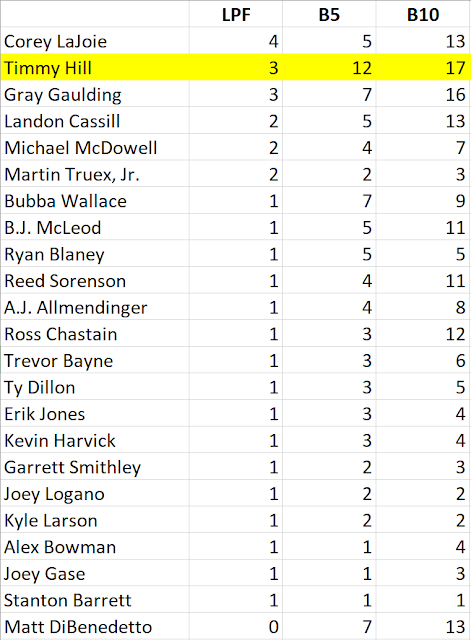 Despite their penalties, neither Larson nor McMurray actually spent any time in the 40th spot. Reed Sorenson, lined up 39th in Premium Motorsports’ #7 Harrah’s North City Chevrolet, lagged back during the first pace lap and stayed alongside Hill in the final row. Also voluntarily falling back were Sorenson’s teammate Ross Chastain, who timed in 32nd in the #15 Durkin Tactical Chevrolet, and 38th-place B.J. McLeod in the #51 Jacob Companies Chevrolet. Coming to the green, Larson lined up alongside McLeod with Chastain, Hill, and Sorenson trailing behind. The gap widened into the first corner, but moments later, both Hill and McLeod slid up the track, and NASCAR officials watched for possible smoke off Hill’s right-front fender. Hill managed to stay in front of McLeod as Sorenson passed them low, giving the #51 last for a brief moment. That changed on Lap 3, when Hill made an unscheduled stop for a stumbling engine, what the crew suspected was a loose plug wire. As Hill came down pit road, he passed the pitting Daniel Suarez, whose #19 ARRIS Toyota made contact with the wall while racing Alex Bowman’s #88 Nationwide Chevrolet. Suarez retook 39th when he came back out one lap down while Hill remained on pit road. On Lap 6, the MBM crew noticed fluid underneath the #66 and pushed him behind the wall. Just behind the barrier, the crew stopped and looked over what appeared to be a loose water hose inside the engine. Then, on Lap 8, they moved the car back to their garage stall. The problem proved terminal, and by Lap 33 the car was pulled off RaceView. Chastain took the 39th spot, having slapped the wall on Lap 41 and pulled into the garage, ending his day by virtue of the “Crash Clock.” Reed Sorenson was already in the garage when Chastain fell out of the race, fighting a car so loose the driver could barely drive it. Sorenson returned to the track and passed William Byron, whose #24 UniFirst Chevrolet blew an engine on Lap 55 and dropped oil around half the track. After returning to action on both Lap 78 and Lap 124, Sorenson climbed past Jeffrey Earnhardt, who turned 151 laps in the #96 Xtreme Concepts / iK9 Toyota before mechanical issues, before retiring himself six circuits later. *This marked the first last-place finish for both Hill and the #66 in a Cup Series race at Kansas. *This was Hill’s earliest exit from a Cup Series race, having turned six fewer laps than when he was parked at Michigan on August 16, 2015. 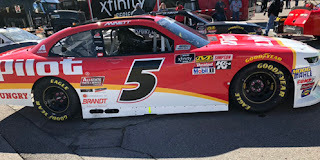 Michael Annett picked up the 3rd last-place finish of his NASCAR XFINITY Series career in Saturday’s Kansas Lottery 300 at the Kansas Speedway when his #5 Pilot / Flying J Chevrolet was collected in a multi-car pileup at the start, preventing him from completing any of the 200 laps. The finish, which occurred in Annett’s 106th series start, was his second of the year and first since Las Vegas, four races ago. In the XFINITY Series last-place rankings, it was the 10th for car #5, the 321st from a crash, and the 516th for Chevrolet. Across NASCAR’s top three series, it was the 33rd for the #5, the 1,166th from a crash, and the 1,631st for Chevrolet. In the three races since his last-place run at Las Vegas eliminated him from the Playoffs, Annett earned three top-twenty finishes: a 14th at Richmond, a 20th on the Charlotte “Roval,” and a 12th at Dover for his best run since Darlington. He had similarly earned solid finishes in the XFINITY Series at Kansas – in all but one of his previous starts, he’d run no worse than 16th with a track-best 8th for Richard Petty Motorsports in 2012. 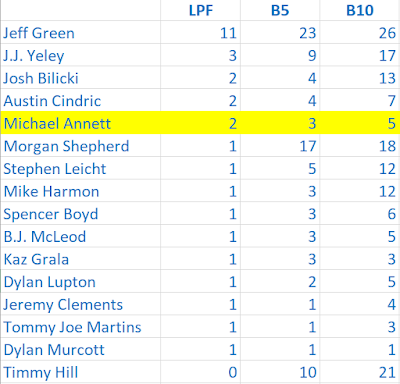 Annett was one of 42 drivers originally entered in Saturday’s race, a group which increased to 43 when RSS Racing fielded a new fourth team, an unsponsored #37 Chevrolet, for J.J. Yeley. Yeley had been moved from RSS’ #38, which at Kansas went to Angela Ruch. However, just like Ray Black, Jr.’s drive for Mike Harmon on the Roval, this RSS car carried the recognizable yellow door and roof numbers of B.J. McLeod Motorsports, indicating it was likely a McLeod car fielded by RSS. While both Yeley and Ruch qualified for Saturday’s race, three other teams weren’t so fortunate. First to miss the cut was Max Tullman, who selected Kansas to make his third and final XFINITY start of the season for his new team, Tullman Walker Racing. After running 27th and 25th in both practices, Tullman’s #26 Eskata / Zoomi Ford failed to make it through pre-qualifying inspection before the end of Round 1, and with only two previous starts on the year, was eliminated on Owner Points. Points also eliminated Morgan Shepherd, whose #89 Visone RV Chevrolet was actually six-hundredths faster than Mike Harmon, who qualified 38th. Third to miss was Bayley Currey, originally not listed as driver of JP Motorsports’ #55 Rollin Smoke Barbecue / Touched by Pros Toyota. It was Currey’s first DNQ after successfully getting the car in for his last nine attempts. Meanwhile, Annett ran 15th in the opening practice and 16th in Happy Hour. He ran 17th in Round 1 of qualifying, then climbed to 15th in Round 2 with a lap of 180.511mph (29.915 seconds). Starting 40th and last on Saturday was owner-driver Jeremy Clements, who like Tullman was unable to turn a lap in qualifying, leaving his #51 RepairableVehicles.com Chevrolet in the final spot. Clements moved up three spots prior to the start, however, as three cars dropped behind him on the pace laps. Mike Harmon surrendered 38th due to unapproved adjustments on the #74 The Journey Home Project Chevrolet while engine changes dropped 22nd-place Ross Chastain in the #4 JD Motorsports Chevrolet and Alex Labbe, 27th in time trials in the #36 AlphaPrimeUSA.com Chevrolet. Ironically, those running at the back of the pack were in the safest place for the start of the race, when no less than four Playoff contenders triggered a massive wreck. Heading through Turns 1 and 2, third-place Justin Allgiaer lost control of his #7 BRANDT Professional Agriculture Chevrolet and slid up into outside-polesitter Christopher Bell in the #20 Rheem Toyota. Trapped behind Allgaier in the outer groove, was 4th-place starter Austin Cindric in the #22 Menards / Richmond Ford, who crossed the nose of Cole Custer’s #00 Haas Automation Ford and was bumped by Chase Briscoe’s #98 Nutri Chomps Ford. As Cindric and Custer spun to the inside, Annett was running to the inside of Ryan Reed’s #16 Lilly Diabetes Ford and following Ryan Truex’s #11 Leaf Filter Gutter Protection Chevrolet to the apron. Truex clipped Cindric’s car, which now slid directly into Reed and Annett’s path. While Reed managed to turn right at the last minute, Annett plowed into Cindric with a closing Spencer Gallagher doing the same in the #23 Allegiant Chevrolet. In all, nine cars were involved in the wreck. Cindric and Annett suffered the most damage, and both cars had to be towed back to the garage. 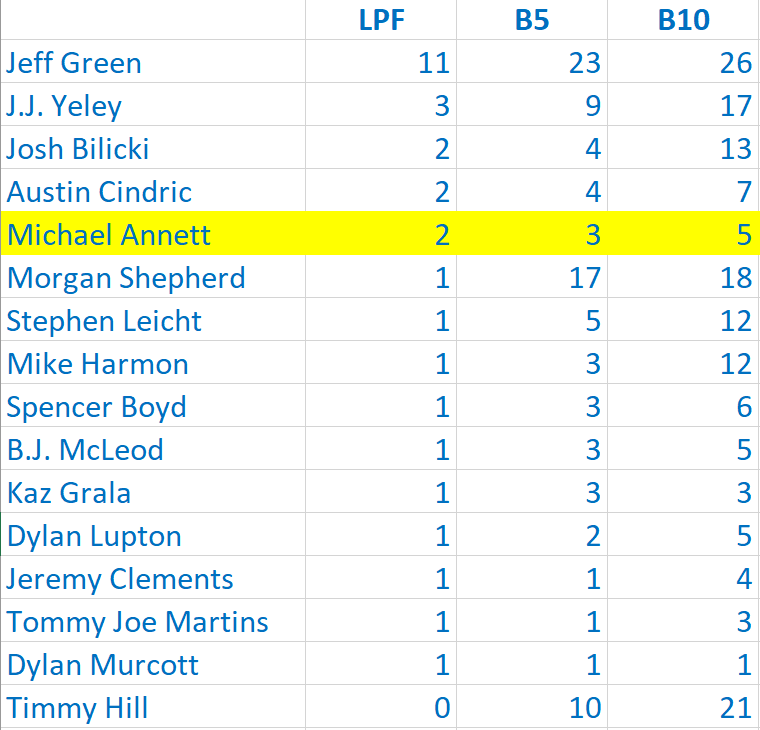 By qualifying behind Cindric’s #22, Annett was classified last with Cindric 39th. Allgaier pulled behind the wall, completing his only lap in the process and finishing 38th. Bell made just one more circuit before taking 37th. Rounding out the Bottom Five was Bell’s teammate Brandon Jones, whose #19 Game Plan For Life Toyota wrecked on the backstretch shortly after the restart. The accident presented a golden opportunity for several drivers, including John Hunter Nemechek, who scored his first XFINITY Series win in his 15th start, just three races after Ross Chastain ended his own “oh-fer” streak in the same car. Shane Lee earned a career-best 3rd in his 10th start driving Richard Childress’ #3. 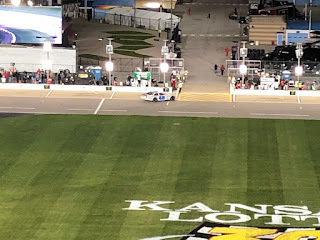 And Ty Majeski, driving the struggling #60 from Roush-Fenway Racing, turned in an 8th-place showing in his first-ever Kansas start. Leading the group was Ryan Sieg in his #39 Frank Foster ‘Til I’m Gone Chevrolet. Sieg finished 9th, the first car one lap down, for his second top-ten finish of the season and first since a 6th at Talladega, nearly matching his track-best 8th in this race back in 2015. Jeremy Clements went from last on the grid to finish 10th for his own second top-ten of 2018 and first since an 8th at Richmond. Prior to Saturday, Clements had never finished better than 17th at Kansas, which came back in 2014. Alex Labbe’s new engine proved stout in the race, as his #36 rebounded from his tail-end penalty to finish 12th, his third-best run of the season behind a 9th at Mid-Ohio and an 11th at Bristol. Both Labbe and teammate Josh Williams in 24th improved on DGM Racing’s previous best finish at Kansas of 26th by Martin Roy two years ago. JD Motorsports took the next two spots with Garrett Smithley’s #0 Chevrolet in 13th and ARCA driver Quin Houff in 14th. For Smithley, it was his best run of 2018 since Talladega, where he finished 10th. For Houff, it was the second-best finish of his career, just two spots short of matching his 12th at Iowa last summer for Precision Performance Motorsports. Joey Gase matched Go FAS Racing’s season-best XFINITY finish of 15th at Las Vgas and Indianapolis in the #35 Absarokatuff.com Chevrolet. Chad Finchum in 16th steered Carl Long’s #40 Smithbilt Homes / The Preserve Toyota to its second-best run of the season, two spots shy of their 14th-place showing under the lights at Daytona in July. It also made Finchum the highest-finishing Toyota in the race. Prior to Saturday, a Motorsports Business Management car had never finished better than 31st at Kansas. Bobby Dale Earnhardt, driving MBM’s #66, also eclipsed that mark with a 27th-place finish in the HABCO Toyota. David Starr’s #52 Wilkerson Crane Rental Chevrolet from Jimmy Means Racing finished 17th, his best finish since Indianapolis, five races ago and the best-ever for a Means car at Kansas, besting Gase’s 19th-place run back in 2012. Jairo Avila, Jr. finished 18th in just his second XFINITY Series start driving the #8 ART General Contractor / JW Transport Chevrolet, beating both his teammates Vinnie Miller in 22nd and, through the apparent RSS partnership, Angela Ruch in 29th. McLeod himself steered JD Motorsports’ #01 to a 23rd-place finish. Spencer Boyd’s 19th-place finish was the best for SS-Green Light Racing since Daytona in July, where they ran 17th, and their second-best of the season, bouncing back from three DNFs in his last five starts in the #76 Grunt Style Chevrolet. Rounding out the group was Josh Bilicki, who avenged the DNQ’d Bayley Currey in the team’s #55 to give JP Motorsports a 20th-place finish. Bilicki’s #45 Prevagen / GNC Toyota cracked the Top 20 for the first time since Mid-Ohio, where he ran in the same spot. *This marked the first time the bottom two finishers failed to complete a lap in a NASCAR points-paying race since November 17, 2017, when both Ray Ciccarelli and team owner Jennifer Jo Cobb trailed at Homestead. It hadn’t happened in the XFINITY Series since October 10, 2014, when last-placer Jeffrey Earnhardt retired on the first circuit along with J.J. Yeley. In Cup, it hasn’t happened since June 25, 2006, when the bottom three failed to reach the stripe – last-placer Tom Hubert, 42nd-place Sterling Marlin, and Ken Schrader in 41st – all collected in a wreck. There are 42 drivers entered for 40 spots in Saturday’s XFINITY Series race, meaning two drivers will miss the show. UPDATE: Make that 43 cars with the addition of a fourth RSS Racing car. B.J. McLeod runs double-duty once again this weekend, but this time moves from Johnny Davis’ #15 Chevrolet to the #01, taking the place of Landon Cassill, who will only run Cup this weekend (see below). Taking McLeod’s place in the #15 is a returning Quin Houff, who we last saw run 31st last month at Richmond driving Davis’ #4. Jairo Avila, Jr. rejoins the McLeod team for his first XFINITY start since his series debut at Bristol, where he ran 20th in the #78. Avila takes the place of Matt Mills, who ran 28th at Dover. Timmy Hill drives in place of Carl Long in the #13 as part of his double-duty sweep at Kansas (see below). Hill’s spot in the #66 goes to Bobby Dale Earnhardt in a Chevrolet. According to Long’s Facebook page, Earnhardt has been working for MBM since 2014, though he’s scaled back to part-time this year. No less than four sponsors will be backing the #66 – HABCO Material, CIA Insurance, WT Contracting, and Lucky D’s Barbecue. Kansas marks the third attempt of the season for Max Tullman and the #26 Ford Mustang following a 30th-place run in Iowa and a 23rd at Las Vegas. The car will be sponsored by Eskata and Zoomi. Added as a late entry Thursday is a fourth car from Ryan Sieg's team for J.J. Yeley, moved from the #38 (see below). Whether or not this car will run the full race is to be announced. Car #37 hasn't made an XFINITY start since September 14, 2013, when Tanner Berryhill drove his family's Dodge at Chicagoland. Angela Ruch, one of Derrike Cope’s nieces, looks to make her second XFINITY start of the season and first since a 30th-place showing at Loudon. Unlike at “The Magic Mile,” where she ran for B.J. McLeod Motorsports, Ruch will drive for RSS Racing, taking J.J. Yeley’s place in the #38. It marks the first XFINITY race without Yeley in the field since Road America, where Brian Henderson ran in his place. UPDATE: Yeley has since been entered in the #37 (see above). Although the preliminary entry list did not show a driver for the #55 Prevagen Toyota, Bayley Currey tweeted that he will once again be driving the car on Saturday, his ninth XFINITY start of the season and seventh in a row. The same tweet indicated the team’s new associate sponsors from Dover - Rollin’ Smoke Barbecue and Touched By Pros – will once again run on the car. 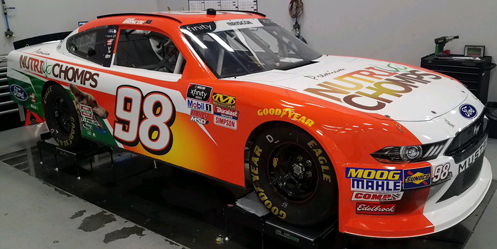 Chase Briscoe returns to the #98 team for the first time since his victory on the Roval, this time with Nutri Chomps as sponsor. Briscoe makes the move from the #60, which this week goes to Ty Majeski, his tenth XFINITY start of the season and first since his 34th-place run on the Roval. Majeski looks for a turnaround with his 7th at Iowa standing as his only finish better than 22nd and four DNFs all due to crashes. Josh Williams regains the #90 Chevrolet for the first time since his 20th-place run in Las Vegas, taking the place of Brandon Brown, 22nd at Dover. It will be Williams’ first start at Kansas. There are 40 drivers for 40 spots, the second-straight full field in 2018 and the ninth in the last ten races. It is the 14th full field in 2018, meaning that 40-car lists in the remaining four rounds will match the current total of 18 short fields this season. Reed Sorenson returns to the second Jay Robinson entry, taking the place of D.J. Kennington, who struggled to a 34th-place showing at Talladega. As in many Kansas races, Harrah’s North Kansas City is the listed sponsor for the Chevrolet. One week after driving a Ford for the first time since Bob Jenkins acquired BK Racing, J.J. Yeley is once again listed in a Toyota, and this time without a listed sponsor. One week after Cody Ware finished under power for the first time in eight career Cup starts, B.J. McLeod returns to the #51, which also swaps from a Chevrolet back to a Ford. Brendan Gaughan closed out his 2018 “restrictor-plate only” campaign with a 12th-place finish at Talladega. The team closes out 2018 with a 28th and 12th at Daytona and a 22nd and 12th at Talladega. If past history is any indication, expect their next attempt to be the 2019 Daytona 500. 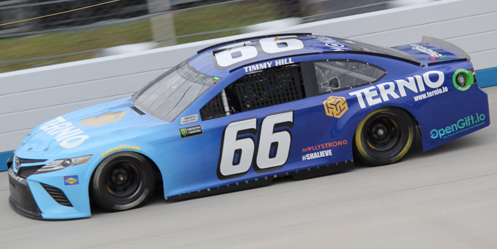 Timmy Hill and the blue Ternio Toyota rejoin the circuit for the first time since their last-place run at Dover. Most significantly, according to the team’s Facebook, it will be the first time MBM has run with their own engine program after employing PME Engines these last two years. The team is also looking ahead to 2019, when they plan to enter a second car at Daytona in addition to “at least” two of their current three XFINITY cars. Victor Obaika’s team isn’t entered this week, one week after David Starr was the only driver sent home in qualifying. While Starr remains with Jimmy Means Racing in Saturday’s XFINITY race, the next start for Obaika’s Cup effort is to be announced. Landon Cassill moves from the #99 to the #00 to take place of Joey Gase, who isn’t entered this week. Gase finished 18th at Talladega, matching Cassill’s season-best run for the #00 last month in Las Vegas. Kyle Weatherman takes the seat of the #99, his own first start since Vegas, and brings with him at least two new associate sponsors – Superior Essex on the TV Panel and Smokin’ Guns Barbecue on the lower quarter-panels. Sunday will mark the one-year anniversary of StarCom's first Cup start, which yielded a last-place run for Derrike Cope. The Truck Series takes the week off and returns the following Saturday on the short track at Martinsville. Aric Almirola’s win last Sunday in Talladega marked the first series victory for car #10 since November 3, 2002, when Johnny Benson, Jr. earned his first and only Cup win at Rockingham. Over those nearly 16 years, car #10 finished last in Cup just four times, including the first career last-place runs for Scott Riggs (March 18, 2007 at Atlanta), Patrick Carpentier (May 3, 2008 at Richmond), and Danica Patrick (October 6, 2013 at Kansas). Patrick authored the number’s most recent last-place run in the series last June at Michigan. Hibbard's car at the Las Vegas dirt track earlier this year. David Hibbard scored the first last-place finish of his NASCAR K&N Pro Series West career in Saturday night’s Toyota / NAPA Auto Care 200 at All American Speedway when his #64 Dave’s Flooring / Ames Rubber Chevrolet fell out with transmission issues without completing a lap. The finish came in Hibbard’s second career series start. David Hibbard is a name known to few, if any, stock car racing fans. Hibbard’s wheelhouse is sprint car racing, as the Oregon native has gained notoriety in the Pacific Northwest for his acumen in that discipline. The 38-year-old has been racing sprints in Oregon for some time, running the inaugural Southern Oregon Sprint Series season in 2013 and finished seventh in points. He then went on a tear this summer, winning five races. Hibbard also has a son, Bailey, who is also a sprint car racer. Bailey is proving to be a chip off the old block, scoring top-fives in sprint car A-mains this summer. David made his debut in a second entry from the Rich DeLong stable, starting last in the field but working his way up to fifteenth, finishing three laps down. Last week's entry list showed sixteen cars, which is quickly becoming average to above-average. Former series champion Chris Eggleston headlined the cast of part-timers, driving a one-off for Bill McAnally Racing. Taylor Canfield returned with a new car number and a new paint scheme after a less-than-great debut at Idaho. Travis Milburn returned for another ride in the 08 car, and Nick Joanides returned with his part-time schedule in the 77 car. Rich DeLong returned in his familiar #84, and Rudy Vanderwal was entered again in the #34. Eggleston led the first practice session, wheeling his #50 to a lap of 13.951 seconds around the one-third-mile track. Hibbard ran the most laps of anybody in the field with 56 but could only manage a lap eight-and-a-half tenths slower than Eggleston, slowest of anyone in the field. Second practice was much the same story as the first – Eggleston led, and Hibbard was slowest. In qualifying, Hibbard still trailed the field, a second behind polesitter Cole Rouse. Hibbard’s effort came to an end early Saturday night. His #64 machine went down during pace laps with transmission issue, with vague “mechanical” issues as the originally listed culprit. The race’s 15th finisher, Derek Kraus, completed less than half of the laps but finished running. An early spin with Thorn derailed what was already a below-average night for the Wisconsin native, and he logged laps from there on out, completing 92. Rudy Vanderwal was the next retiree from the race, with brakes at fault for his first DNF of 2018. His son Kody fell out with drive train issues after 117 laps. Eggleston rounded out the Bottom Five, his Toyota careening hard into the Turn 3 wall on a restart near the three-quarters mark of the race. With one race to go, all three LASTCAR championships have been clinched. Chevrolet has outscored all other manufacturers combined, and Patriot Motorsports Group has outscored all other teams combined. Jesse Iwuji has three last-place finishes, while no other driver has more than one. McDowell's crew attends to the right-front hub at Talladega. Michael McDowell picked up the 30th last-place finish of his Monster Energy NASCAR Cup Series career in Sunday’s 1000Bulbs.com 500 at the Talladega Superspeedway when his #34 Speedco / Rotella Ford finished under power, completing 155 of the race’s 193 laps. The finish, which came in McDowell’s 280th series start, was his second of the season and first since the spring race at Las Vegas, 28 races ago. In the Cup Series last-place rankings, it was the 31st for the #34, the 34th where the driver finished running, and the 686th for Ford. Across NASCAR’s top three series, it was the 43rd for the #34, the 44th where the car was running, and the 945th for Ford. In doing so, McDowell broke a tie with the late J.D. McDuffie for the fifth-most last-place finishes across all three of NASCAR's top divisions. Ever since Las Vegas, McDowell has enjoyed a handful of mid-pack performances in his first year for Front Row Motorsports, not to mention a brilliant run at Daytona in July. After a 9th-place finish in this year’s Daytona 500, McDowell qualified 8th for the 400 and led 20 laps, pacing the field as early as Lap 89 and as late as Lap 113 before he was collected in a pile-up with just five laps to go in regulation. It was the third of five DNFs the Phoenix native had collected since Las Vegas, all of them due to crashes. With five top-twenty finishes in the last ten races headed to Talladega, McDowell looked to turn things around on the plate tracks. 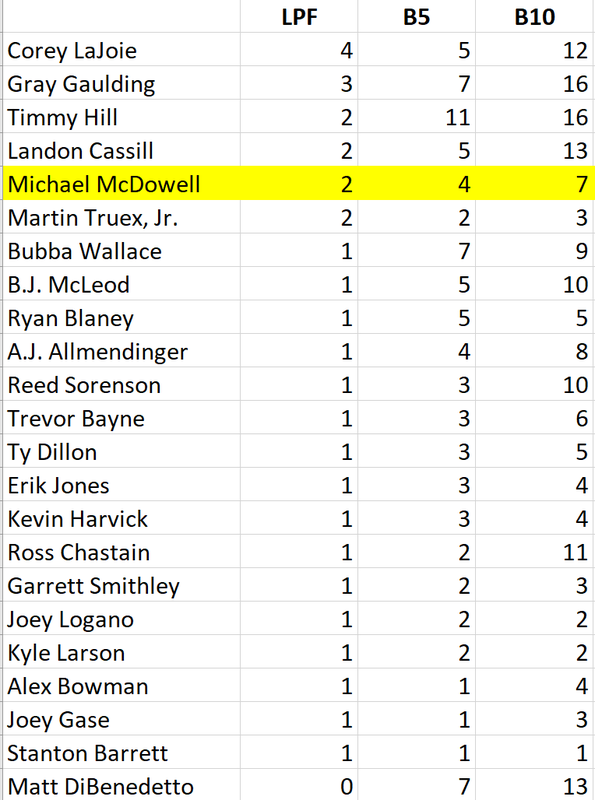 McDowell was one of 41 drivers competing for spots in the 40-car field, and one of the 36 locked-in by virtue of his Charter. He ran 27th in the lone practice session and came just two-hundredths of a second short of making Round 2 with the 14th-best lap of 192.509mph (49.743 seconds). Further back, two-tenths of a second sent home Obaika Racing, which late in the week hired David Starr to attempt their first Cup Series race. Using both a hauler and car acquired from BK Racing, Starr’s #97 Vroom! Brands / Brand South Africa Toyota ran faster than two Chartered cars, but was sent home for not catching 38th-place Landon Cassill in StarCom Racing’s #99 Chevrolet. The 40th and final starting spot was to go to Cody Ware, the second Chartered car Starr beat in qualifying. Ware’s turn in the #51 Jacob Companies Chevrolet yielded the slowest lap of the session, a lap of 183.136mph (52.289 seconds). However, 39th-place qualifier Corey LaJoie failed his first go-round in post-qualifying inspection, sending the #72 Winn-Dixie Chevrolet to the back of the grid for Sunday. LaJoie, whose car passed inspection on the second go-round, would incur a redundant tail-end penalty on Sunday for unapproved adjustments, soon to be followed by 37th-place starter Joey Gase (#00 PFK Foundation Chevrolet) and 34th-place Kyle Larson (#42 Credit One Bank Chevrolet). On Sunday’s pace laps, LaJoie held the 40th spot on the high side of Row 20 with Ware to his inside. Both dropped to the back a second time after Larson joined them. Falling back voluntarily were Premium Motorsports teammates D.J. Kennington (starting 33rd in the #7 Wilride Transport Ltd. Chevrolet) and Ross Chastain (36th in the #15 Xchange of America / Solomon Plumbing Chevrolet). After sorting themselves out, Kennington pulled to the inside of LaJoie in the final row with Ware to the inside of Chastain in Row 19. When the green flag dropped, Kennington trailed in the high lane, but caught Ware to his inside, putting the #51 back to last as the field crossed the stripe. Moments later, however, the group screamed past 16th-place qualifier David Ragan, who was carrying sponsorship from the race’s title sponsor 1000Bulbs.com. Ragan had been running among the leaders on Lap 1 when his car lost oil pressure in the outside lane, forcing him to jump to the third lane and out of danger. The #38 then fell to the back of the field, losing a lap as he made it down to the apron. The crew looked under the hood, noticing just 13 pounds of oil pressure, then managed to get him back on track on Lap 6, five laps back of the leaders. Ragan then lost oil pressure just past pit exit, forcing him to the garage on Lap 9, just seconds before Jeffrey Earnhardt drew the first caution for spinning the Gaunt Brothers’ #96 Xtreme Concepts / iK9 Toyota. By Lap 29, the Ragan crew managed to get the #38 out on track a second time, 20 laps down in last, but at full speed. Front Row Motorsports’ day went from bad to worse around Lap 77, when McDowell first encountered trouble. As with Ragan, McDowell pulled behind the wall under green, citing a problem with the right-front wheel. The crew discovered a problem with the right-front hub, and though NASCAR.com’s RaceView pulled the #34 off the screen on Lap 87, the team continued to work on their repairs. McDowell took last from his teammate on Lap 98, then on Lap 114 was rolling again in the garage area, just in time for the caution that ended Stage 2. The Ford rejoined the race 37 laps down, then lost a 38th on the ensuing restart as he pulled high to let the leaders pass. At the time, all 40 entrants were still running with much of the Final Stage left to run. For the rest of the afternoon, McDowell and Ragan didn’t lose another lap, but neither were able to climb past the handful of drivers having trouble further up the running order. On top of Earnhardt’s early spin, single-car incidents involving Jimmie Johnson, Kyle Larson, and Jamie McMurray did not eliminate all three drivers from competition – in fact, both Johnson and Larson finished on the lead lap in 7th and 11th, respectively. Thus, on Lap 150, all lead-lap cars were eliminated from last-place contention, and with the same 18-lap gap between McDowell and Ragan, McDowell all but secured last place on Lap 170, pending a green-white-checkered finish. 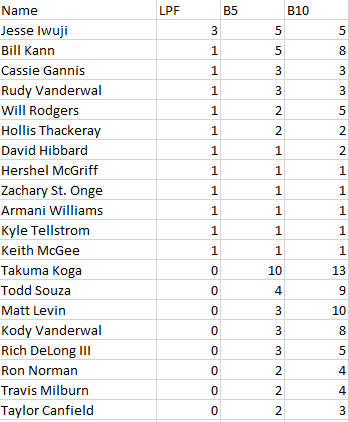 While the race did end up going into overtime due to late accidents, no driver in the Bottom Five wrecked out, keeping the final five positions largely unchanged. 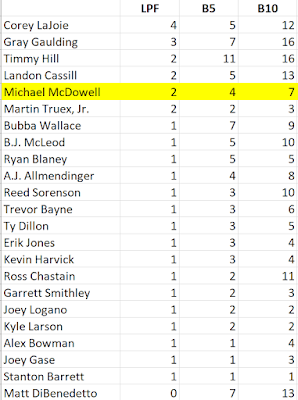 McDowell secured the 40th spot by his 18-lap margin over Ragan. Ware took 38th in a three-way tie with two other drivers eight laps down to the leaders. First was Earnhardt, who lost five laps after his spin, then another three by the finish. Rounding out the group was J.J. Yeley, the day’s only DNF, after his Ford rear-ended a sliding Alex Bowman with two laps to go in regulation. Yeley, whose #23 Steakhouse Elite Ford made the switch from Toyota for the first time since Front Row Motorsports owner Bob Jenkins acquired the team in August, ended up the third FRM car in the Bottom Five. Still searching for a ride in 2019, A.J. Allmendinger led a lap in his #47 Kroger ClickList Chevrolet and finished 6th, his second top-ten finish in the last three races. Regan Smith lost his drafting partner on the final lap, but managed to steer the Leavine Family Racing team’s #95 Procore Chevrolet to a 10th-place finish, Smith’s best finish since relieving Kasey Kahne, and the team’s best run since Kahne’s 4th at Daytona in July. Just on the outside of the Top 10 came Brendan Gaughan, 12th in his second-straight plate race for Beard Motorsports in the #62 Beard Oil / South Point Hotel & Casino Chevrolet. Joey Gase managed to rebound from his DNQ in the Truck Series race to finish 18th, his own season-best, improving even on his 25th in the crash-marred Coke Zero Sugar 400 at Daytona. *This marked the first time car #34 finished last in a Cup Series race at Talladega. *It was McDowell’s second last-place finish in a Cup race at Talladega, and his first since May 6, 2012, when his #98 Curb Records Ford fell out with a vibration after 2 laps of the Aaron’s 499. *The 155 laps McDowell completed were the second-most of any Cup Series last-place finisher at Talladega. The lead remains with the late Marty Robbins, who was disqualified for a restrictor plate violation after he turned 179 laps on May 7, 1972. *This was also just the second time that a Cup Series driver finished last at Talladega while still under power at the checkered flag. The only other instance was on May 1, 2005, when Kyle Petty’s #45 Georgia-Pacific / Brawny Dodge finished 88 laps down in the Aaron’s 499. Clay Greenfield picked up the 3rd last-place finish of his NASCAR Camping World Truck Series career in Saturday’s Fr8Auctions 250 at the Talladega Superspeedway when his #68 AMVETS Please Stand Chevrolet fell out with suspension issues after he completed 47 of 94 laps. 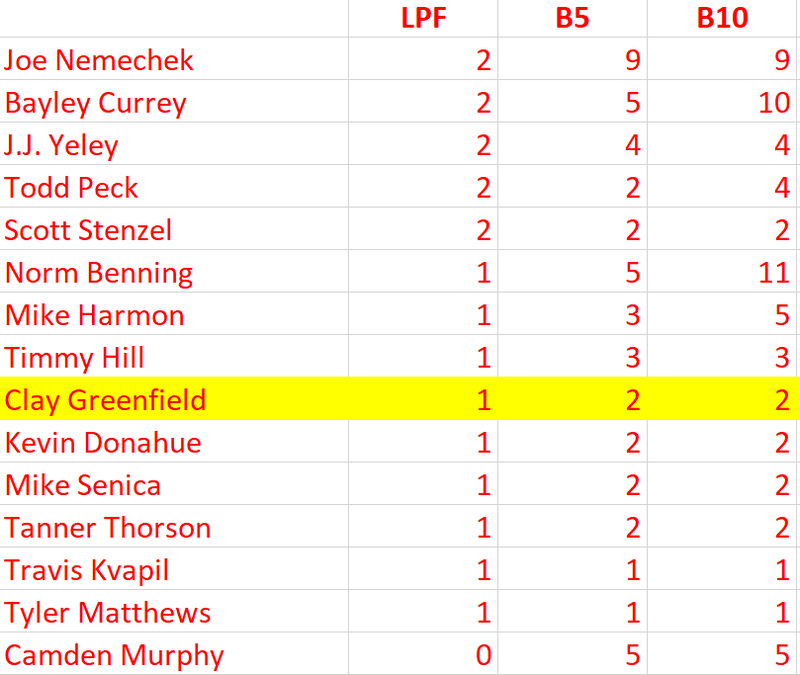 The finish, which occurred in Greenfield’s 42nd series start, was his first of the season and his first in the series in over six years, dating back to September 28, 2012 at Las Vegas, 137 races ago. In the Truck Series last-place rankings, it was the 3rd for the #68, the 14th for suspension issues, and the 362nd for Chevrolet. Across NASCAR’s top three series, it was the 26th for the #68, the 38th for the suspension, and the 1,630th for Chevrolet. Talladega marked just the sixth attempt of the season for Greenfield and his family’s #68 team. The year began with a career-best 3rd-place starting spot at Daytona, a night that ended with a late-race crash in Turn 4 that left him a disappointing 22nd. Following a 28th-place run for TJL Racing, Greenfield was supposed to bring his team back to Charlotte, but they withdrew. He finished 20th the next time out at Texas, 21st at Kentucky, then ran 20th in the Bristol night race, only to be incurred a penalty for dropping ballast on the race track. Through it all, the AMVETS veterans’ organization continued its support of Greenfield’s #68 team, and invited him to the group’s national convention in August, where he was awarded a lifetime membership. 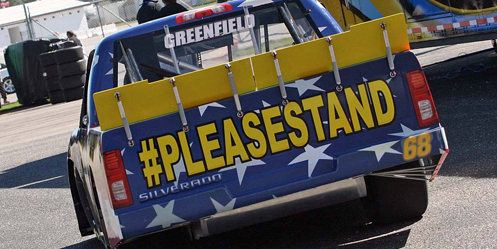 Greenfield’s patriotic-themed Chevrolet carried the message “Please Stand,” referencing the group’s stance on the ongoing “Take A Knee” protests. Greenfield’s own tie with the NFL is his wife Tandra, a former cheerleader for the Tennessee Titans who he married in 2015. This newest backing from AMVETS came after several small businesses supported his team, including Clutch Defense, Titan Paint Sprayers, and 1-800-Pavement, the latter tied to Greenfield’s part-time work in the paving industry. The black pavement scheme gained its most attention in the final laps of the 2013 Last Chance Qualifier at Eldora, where his RAM raced door-to-door with Norm Benning’s Chevrolet for the final transfer spot. Greenfield looked to do much better at Talladega, where he’d earned a career-best 8th just last fall. Greenfield was one of 36 drivers entered to attempt Saturday’s 32-truck field. After not running a lap in opening practice, he ranked 17th of 26 drivers in Happy Hour, then ran 18th in qualifying with a lap of 178.271mph (53.716 seconds). Fastest of the four drivers to miss the show was defending last-placer Norm Benning in the #6 H&H Transport Chevrolet. 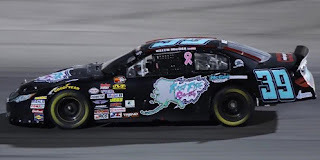 Joining him were Joey Gase in the #83 PFK Foundation / Sparks Energy, Inc. Chevrolet, Ray Ciccarelli in the #0 CMI Installations Chevrolet, and Jamie Mosley, slowest overall in Premium Motorsports’ #15 VIP Racing Experience Chevrolet. Starting 32nd and last on Saturday was Wendell Chavous, who announced on Monday that Talladega would be his 50th and final series start so he could spend more time with his family and his business. Following the DNQ of his teammate Mosley in the #15, Chavous’ #49 SobrietyNation Chevrolet put up a time of just 173.507mph (55.191 seconds), ranking him last of the five drivers needing Owner Points to make the show. Prior to the green, Chavous would be joined by no less than seven drivers sent to the rear for pre-race penalties. Five were sent there due to unapproved adjustments: 5th-place Johnny Sauter (#21 ISM Connect Chevrolet), 10th-place Austin Hill (#02 Young’s Building Systems / Randco Chevrolet), 11th-place Stewart Friesen (#52 We Build America Chevrolet), 20th-place Parker Kligerman (#75 Food Country USA Chevrolet), and 31st-place John Hunter Nemechek (#8 Fleetwing Corporation Chevrolet). In addition, 25th-place Scott Lagasse, Jr. (#30 Strutmasters.com Toyota) was sent to the back for an engine change, 28th-place Myatt Snider (#13 RideTV Ford) for a tire change, and FS1 reported 16th-place Justin Haley went to the back because NASCAR didn’t like where the cooling devices were located on his #24 Fraternal Order of Eagles Chevrolet. 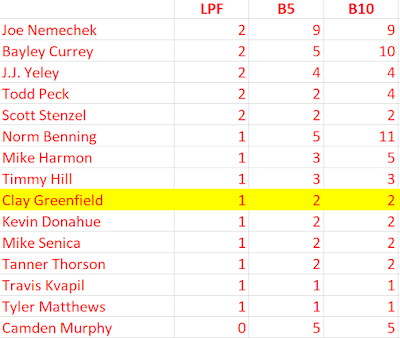 Greenfield, meanwhile, dropped back in the early laps, and appeared to be among the six trucks who fell back of the lead pack in a single-file group by Lap 3. On Lap 11, he had completely lost touch with the trucks around him, and went a lap down as the field roared by to his high side in Turn 1. By the time the race restarted after Stage 2, Greenfield was behind the wall, done for the day with suspension issues. Chris Knight tweeted that he had come down pit road with smoke trailing from his Chevrolet. Intense, but surprisingly clean racing kept the Bottom Five open for much of the race. 31st ended up with Las Vegas last-placer Tanner Thorson, who also suffered suspension issues on the #12 K&L Ready Mix / Nyloxin Chevrolet following a flat left-rear tire that sent him spinning down the backstretch. Joe Nemechek qualified a strong 7th in the #87 Fleetwing Corporation Chevrolet and led his first two laps of the season before a vibration eliminated him at the 50-lap mark. Rounding out the group were two of the drivers eliminated in the day’s biggest accident on Lap 59. After he was collected in the Turn 4 pileup, Parker Kligerman’s #75 careened down the banking and crossed the nose of Bo LeMastus’ #54 Fred’s / Crosley Brands Toyota. Kligerman then struck the inside wall nearly head-on. After crews came to the scene, Kligerman climbed out and lay on his back for a moment before he walked away, apparently without serious injury. The wreck that collected Kligerman and LeMastus was triggered by one of a number of intriguing underdog storylines. Plate-race specialist Chris Fontaine fielded a chassis called “Freak,” a truck built for Bobby Hamilton Motorsports’ Dodge effort in 1998. The full pedigree of the truck is discussed in this article by racing-reference.info writer NASCARMAN at this link. On Saturday, Fontaine had worked his way up to 2nd, pushing Grant Enfinger to lthe lead with 38 laps to go. Moments later, Fontaine crossed the nose of a closing Justin Haley, sending him spinning down, then back up the track. While the driver was uninjured, there was little left of “Freak” as the #47 Glenden Enterprises Toyota was towed to the infield, 24th at the finish. When we last heard of Jim Rosenblum’s team FDNY Racing, the team had reportedly shut down permanently after driver Bryan Duzat failed to qualify for this year’s season opener at Daytona. But when the preliminary entry list for Talladega was posted, Dauzat and the #28 FDNY / O.B. Builders Chevrolet were right there. This time around, the driver made the cut, squeezing his way into the 27th and final spot set on speed by a half-second over Norm Benning. In the race, Dauzat flirted with the 20th spot, then jumped to 6th after the big wreck and 5th with 20 laps to go. After slipping back to 13th in the final laps, Dauzat climbed back up to 8th by the finish – the first-ever top-ten finish for team owner Rosenblum after 35 years in NASCAR. After starting 22nd, owner-driver Jennifer Jo Cobb ran up to the 6th spot on Lap 29, firmly defending her spot in a single-file draft. Her #10 Osage Contractors / Driven2Honor.org Chevrolet then climbed up to the front row to start the final stage, only to be moved to the middle lane and out of the lead draft. She then worked her way up to the 11th spot at the finish, closing out the day with three laps led during the yellow for the big wreck. These were the first laps Cobb led since Chicagoland, and the first time she’d ever led multiple laps in a Truck Series race. Austin Hill came to Talladega with a career-best 8th two months ago in Mosport and six top-ten finishes, and though he’d finished 10th three times before Saturday, Talladega’s was a career run. Hill led two laps early, then found himself out front for the start of Stage 2, where he led another six circuits. Third on the restart for the final stage, Hill was black flagged for passing Cobb below the yellow line, and lost a lap with 18 to go. He then earned the Lucky Dog when Todd Gilliland wrecked off Turn 4 with six laps to go, and just like that, the #02 was back battling into the Top 5 – only to be ensnared in the last-lap tangle after race winner Timothy Peters dumped Noah Gragson. Teammate Max Tullman in the #20 YurPal.com Chevrolet finished one spot in front of Hill, his first top-ten finish in just his third series start, and his first run better than 23rd. Driving through the smoke in a #3 Rusty’s Off Road Toyota without the manufacturer’s crest on the dislodged grille of his machine, fan favorite Jordan Anderson was all smiles with a 7th-place finish, backing up his 9th-place run in this year’s Daytona opener with a new career-best. Anderson had made just one Talladega start in the series before – three years ago, when he ran 19th for Mike Harmon, who dropped charges brought against Anderson earlier this month relating to one of his race trucks. Robby Lyons earned a ride in Josh Reaume's #33 Sunwest Construction Chevrolet and worked his way into contention in the final laps. Making his first Truck Series start since his release from Premium Motorsports, Lyons made a bid for a top-ten finish before he ended up 14th, his best run since a 13th in this year's Daytona race and the best-ever for Reaume's young team. To cap it off, Wendell Chavous closed out his Truck Series career in style. Running 7th just moments before Gragson wrecked, he climbed into the 5th position at the moment of caution, then pulled alongside race winner Timothy Peters as both took the checkered flag. NASCAR.com’s leaderboard even showed Chavous across the stripe first, though the official results would later be set by the scoring loops. Prior to Saturday, Chavous’ best finish had been 12th, which came both at Daytona and Texas earlier this year. It was also the first top-five finish for Jay Robinson’s Truck Series team in 112 combined starts dating back to 2015. *This marked the first last-place run for the #68 in Truck Series competition since Greenfield’s first last-place run at Charlotte on May 18, 2012, when his #68 @ClayGreenfield RAM fell out with power steering issues after 6 laps of the North Carolina Education Lottery 200. The number had never trailed a Truck race at Talladega.